THE speed with which train services were restored after a settlement in the strike of locomotive men had been reached on June 14 reflects great credit on all concerned. Despite the fact that many engines had been “ dead ” for over a fortnight, suburban services were either normal or only slightly curtailed on the morning of Wednesday, June 15. It was widely believed, however, that full services could not be resumed quickly, and for the remainder of the week many people continued to use other forms of transport. Main—line services naturally took rather longer to restore, but were almost normal by June 16. The successful efforts to keep freight traffic moving during the strike resulted in a comparatively small backlog awaiting clearance. 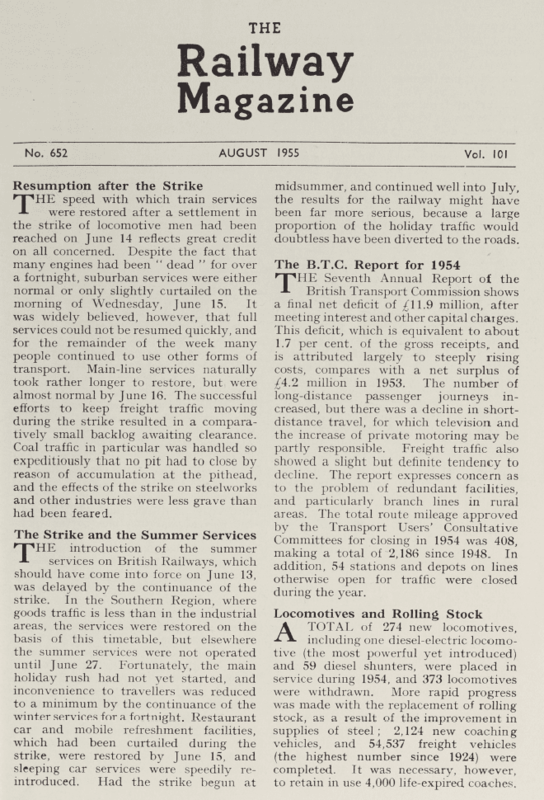 Coal traffic in particular was handled so expeditiously that no pit had to close by reason of accumulation at the pithead, and the effects of the strike on steelworks and other industries were less grave than had been feared.